Although Dave and I definitely wouldn’t fit the title of “hostess with the mostest” we do enjoy having people over, feeding them, entertaining them, and letting our kids run around like crazy people together! I’m often asked how I simplify the entertaining process — and more specifically, how I simplify the FOOD. Food seems to be such a huge stressor and a cause of concern for so many people that even smaller, simple gatherings of friends or family turn into stressful affairs when someone can’t figure out what to serve, what to make, when to make it, what to buy, etc. etc. In general, my motto for entertaining is to SERVE FOOD I CAN MAKE IN ADVANCE (yes, even for big meals like Thanksgiving!) 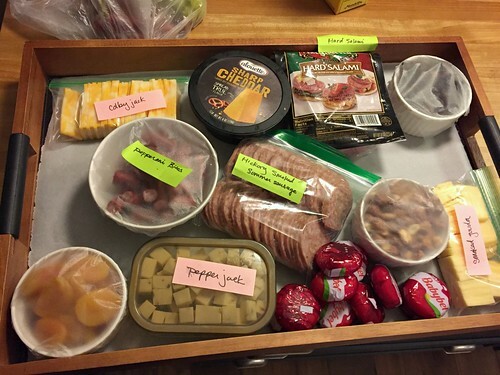 so I don’t have to worry about last-minute food prep when guests are arriving or when I’d rather hang out with people than be cooped up in my kitchen the entire time. I do lots of meat in the slow-cooker, make-ahead casseroles and side dishes, raw veggies, make-ahead salads, and fruit that can be cut in advance without going brown. However, in an effort to simplify entertaining EVEN MORE, I have a favorite go-to appetizer platter that I can whip up in minutes if we have last-minute guests. I can also make well in advance if I have the time. This 5-part foolproof appetizer is perfect any time of year, for any type of party, and can accommodate almost any dietary restriction or food allergy. Plus, it’s super simple, fairly frugal, and uses many ingredients you can buy ahead and stock up on when they are on sale… so you always have them in the house. In fact, our family loves these 5 “food groups” so much that we regularly eat a large appetizer platter as a full meal! Meat can sometimes be tricky for appetizers (especially if it needs to stay really warm or really cold) but I feel that SOME type of meat is essential for a well-rounded appetizer platter. Of course, I love hot meat options as well (meatballs and these bacon-wrapped sausage links are 2 of my favorites) but those aren’t always practical and can’t always be transported well. 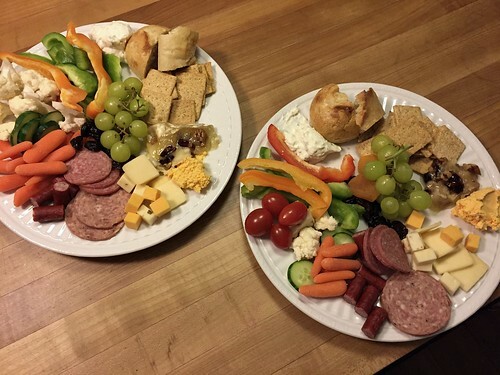 So for a quick appetizer, I usually stick with the cold cut meats; and I always have them sliced and prepared well in advance (sometimes a few days) so there’s no last-minute work except setting the meat on the platters for people to grab! 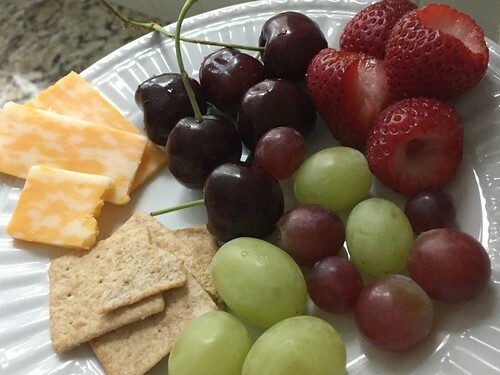 This is probably my favorite part of an appetizer platter — partially because our whole family LOVES cheese, but also because there are so many amazing varieties of delicious cheese available at most grocery stores that it’s very easy to get creative and prepare a gourmet-looking appetizer tray with minimal effort. 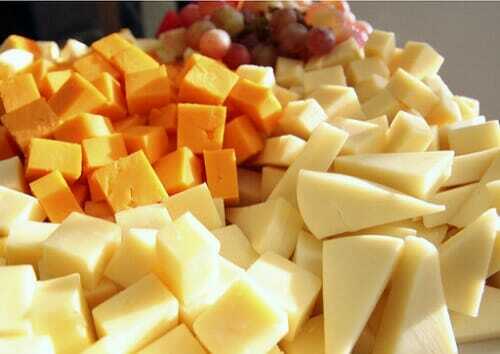 I usually try to have at least 3 or 4 different cheese varieties, and I slice/serve them differently as well. There are endless possibilities when it comes to delicious cheese! You can be as fancy or as frugal as you want with cheese — even the spray cheese in a can could go over well depending on your crowd and the type of party you’ll be serving the food at. The beauty of all these different cheese options is that they can all be sliced, cubed, or prepared several days in advance and simply stored in separate air-tight containers until you’re ready to serve them. Often, around the holiday season, I’ll bring baked brie with candied pecans and dried fruit on top — but of course, that only works if I’ll be somewhere with an oven and if I want to do the last-minute prep work. This is another one with endless options — seriously, there are SO many different types of delicious crackers, nuts, and seeds — just pick a few of your favorites and keep them in your pantry (or freezer) and you’ll always be ready to throw a quick appetizer platter together. I usually decide on my cracker choices after I know what types of meats and cheeses I’ll be serving. I will also include chunks of crusty bread if I think it works (or even homemade rolls) but that’s not as easy to keep on hand or to prepare at the last minute — plus, the bread will get stale much quicker than the crackers or nuts will. My main objective with fruit is to choose varieties that can be eaten without utensils (a.k.a. no peaches!) and that won’t turn brown or taste bad after sitting out in the open (no bananas). I also try to pick fruits that will go well with the meat and cheese I’m serving. Grapes (these are kind of a no-brainer and I serve them in small clumps on basically every appetizer tray). If you don’t mind using utensils, then you can include cubed melons, other berries, peaches, pears, pineapple, etc. And again, you can be as simple or as extravagant as you want. We ALWAYS have dried fruit in the house, and almost always have grapes and apples — so if I’m in a pinch, grapes, apples, and craisins are what I serve. Oh, and I usually do NOT serve fruit dips like caramel, marshmallow dips, or cream cheese-based dips because I personally just never make them or have them in the house — however, it would be a good addition if you were serving lots of fruits and had large enough plates for your guests. Although there are so many options when it comes to raw veggies, I try to stick to more “common” varieties when I make my appetizer platters. 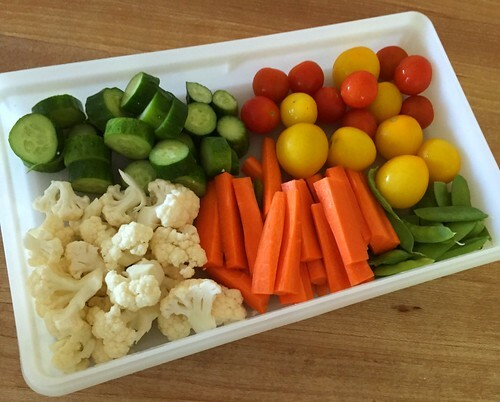 Also, olives and pickles often go over well on these types of trays. I like to choose at least 3-5 different veggies, and I try to make sure they are all different colors so the platter looks nicer. I usually DO include some type of vegetable dip and hummus. So that’s it – my favorite 5-part foolproof appetizer platter! 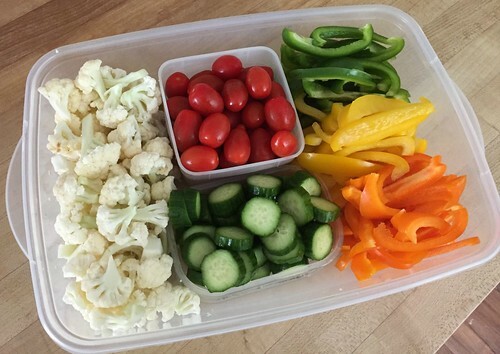 You can get as fancy as you want with presentation too — sometimes I just put out plastic food storage containers with the different types of food in it. Other times, I break out all sorts of cool serving trays and platters to display everything nicely. 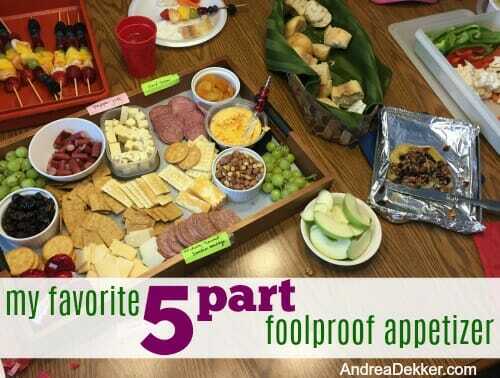 As I mentioned above, this 5-part platter can work for almost any party and almost any time of year — just mix up the contents based on in-season fruits and veggies, whatever meats and cheeses you have in the house, or whatever is on sale at the grocery store. 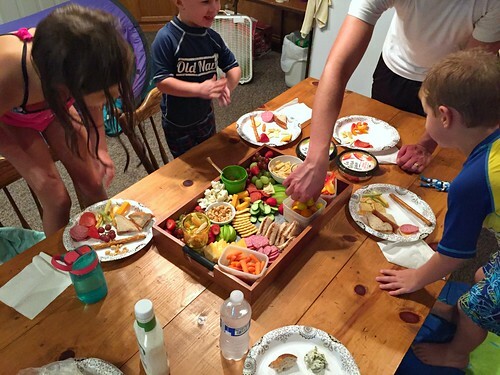 Also, I’ve honestly never had an occasion where someone at my party is unable to eat anything on my platter. There’s a little something for everyone in this “foolproof” appetizer platter! Thanks for this great idea – just solved my dilemma for Christmas Eve with very finicky grandkids! haha — you’re welcome! I’m certain your grandkids will love this option!! Do you find that it costs less to buy these items for a party as opposed to making a meal? I’m guessing the cheese, nuts, and different varieties of sausage would add up. Excellent article, and beautiful photos!! This is such a great idea, it is a saver for sure. it’s JCPenny Home brand — purchased many years ago on clearance. We LOVE it too! Great post. Simple. I’m keeping this forever since I always stress about what everyone will like and it seems everyone has a dietary issue nowadays. We are planning a girl’s wine tasting/picnic afternoon and the combinations are perfect and will be easy to pack. 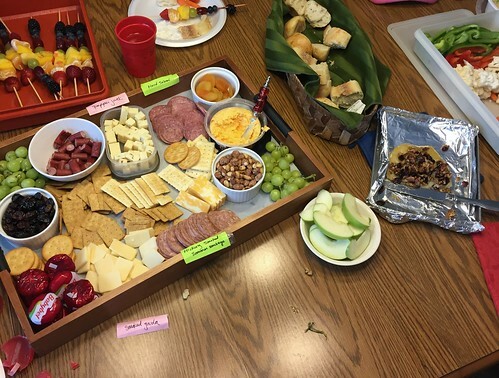 There are 6 of us, so this addresses all the dietary issues, and each person can bring a couple of items from each “part” to share, and one can bring something sweet or chocolate to round it out. Perfect timing, thanks for making it so easy. sounds like a great plan — simple and not stressful. 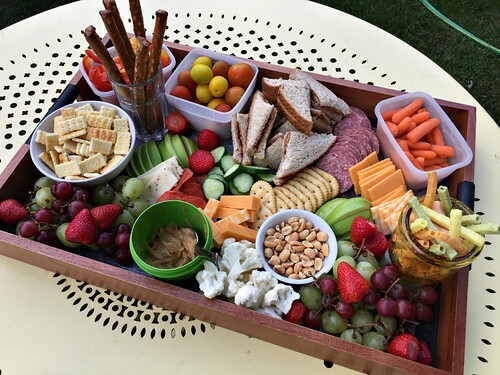 Enjoy your wine tasting picnic!! I soak apple slices in water with a little salt in it, and they don’t turn brown. Works great, too, if you need apples for a sack lunch, etc. and the salt taste doesn’t bother you? I do this when I can applesauce and it doesn’t affect the taste of the sauce, but if you I eat an apple slice raw, I can really taste the salt. This is my favorite food, quite a few of our friends as well so we will just do a giant one of these for a shared meal, nothing else (some nice chocolate for the dessert). I even had this for our wedding rehearsal party (one relative was quite upset that there was nothing else – he needed to have a hot meal!) – it was perfect. Yes, Dave and I love appetizer platters (as long as there’s a decent variety!) We will gladly eat it as a full meal every once in awhile! For our appetizer trays we like to make ham roll-ups. 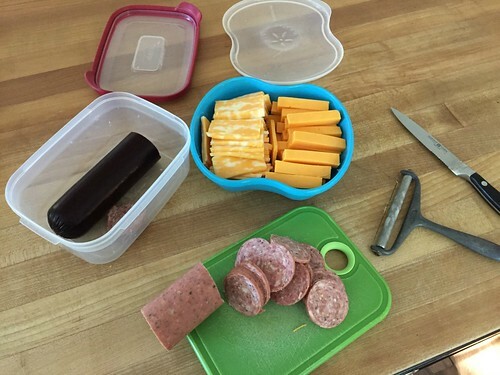 Not quite as simple as just cutting up summer sausage or placing pepperoni on the tray but if one wants to spend a little extra time they’re tasty and go over very well. We take a slice of deli ham, spread softened cream cheese on it, place a green onion on one of the sides, roll it up, and slice it into approx. 1 inch pieces. I am hostess for our large family for Thanksgiving and Christmas every year. We end up with approximately 25-30 people for each of these events. With so many people there’s always a problem coming up with a menu. Something that someone wants, someone else doesn’t…EVERY YEAR! It’s quite frustrating. Most of us want the formal, delicious, sit down meal for Thanksgiving but would rather have a less formal Christmas dinner opting for appetizers and finger foods instead. But my mom is old-school and wants a formal dinner for both. The larger our family gets the harder it is to get everyone seated and served and it gets chaotic. By the time the last person gets their food the first person is going back for more. Unfortunately renting a bigger venue isn’t in our budget at that time of year and it’s been discussed how that wouldn’t feel cozy like being at one of our homes. Would you have any solutions for this delimma? Any input would be greatly appreciated. 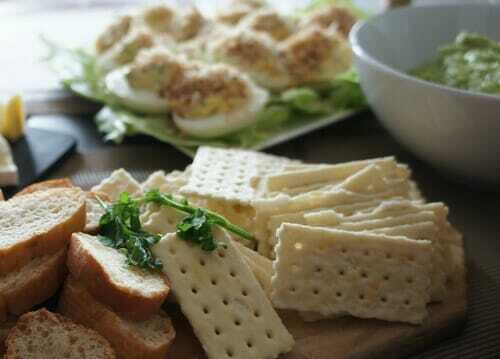 Thank you for these wonderful appetizer platter ideas. Makes me want to throw a party! Or at least go to one. Our family is getting larger also and we too face the dilemma of what type of meal to have with such a large group. Both sides of the family are near us so all need to be invited. This past Christmas we hosted at my house and we just had everyone bring an appetizer and I made several simple desserts. It worked out great as everyone was able to hold a small plate and stand or sit where they could find a place. We let the little kids all sit at the table and then everyone else either sat in the living room, patio or hung around the kitchen. Our rooms are all open so we were all still close to everyone. We have a large 8 seater table but no way could we have a formal sit down dinner with 20 something people. I thought it worked out well and everyone had a good time. We only had one person complain that she couldn’t bring a turkey. She ended up cutting it up before into small pieces. Another suggestion might be a local park with picnic type foods. Depending on where you live, this might not be a great idea that time of year. I’m in South Florida. Some years it is too hot even at that time of year for an outdoor event. I would love to attend an appetizer and dessert party! With that many people I’m sure you had plenty of variety too. After the big turkey meal on Thanksgiving, I usually make Mexican food for Christmas. We love it. In my opinion, you can NEVER please everyone so I don’t even try. I know that might sound snotty — but it’s true. People will always complain no matter what you do, so if I’m doing the work to host, I do what Dave and I want to do. If someone is that upset about it, they can offer to host the next time! My mom’s side of the family (ALLLLLLL my aunts, uncles, cousins, spouses, and cousins’ kids) rent one of our churches for a Christmas potluck. It’s not as “cozy” as a home but you can’t have “cozy” with 60+ people unless you live in a mansion!! It works well, it’s easy, and everyone brings a hot and cold dish to pass so there is TONS of food! I’d say, if you’re willing to host and you can fit everyone in your home, do what YOU want to do. You could even send an email out well in advance explaining that you are willing to host (and what you’d suggest for the menu) but then open the door to anyone else who might want to host instead. If no one offers, you are free to do what works best for you. Andrea, a great recommendation to offer extended family in advance with what you’re willing to do. Plus a gracious way to eliminate potential complaints. well, it might not “eliminate” complaints, but at least you know they aren’t justified!! Great post! I’m an unconfident hostess and really appreciate this. Would love to see more ideas for easy, make ahead meals for entertaining! I would say 85% of the recipes on my blog are recipes that can be made ahead and would work for entertaining! Great post that should help readers feel more confident when hosting! We often have guests out on our boat, and I usually have these same items for a snack! I completely agree about having the food prepared ahead of time for any gathering! I learned this from my mother – she even makes things days in advance and freezes it until the party. This is terrible to admit, but I’m actually annoyed when someone invites us over for a meal and they are prepping and cooking it while the guests are there. I’m convinced that those who don’t like entertaining feel like that because cooking in front of hungry people is stressful! yes, Dave and I are always amazing how often people are still cooking when guests arrive (and simply things that could have easily be done WELL in advance. I know some people think it’s more “inviting” to cook WITH your guests, but with 3 little kids, I don’t want everyone to be hanging out in the kitchen or to be expected to “help” finish a meal when I go to someone’s house. When we have people over, everything is done in advance, the kitchen is fairly clean already, and we can sit and chat when our guests arrive until we’re ready to eat. Yes, now that I’ve been hosting for close to 20 years, I’ve realized that my Mom’s staying in the kitchen for the entire holiday has more to do with introversion and martyrdom than necessity! I hate being chained to the kitchen for a holiday or dinner party. We might spend 45 minutes doing last minute things right before we serve, but otherwise we are enjoying our company because we planned and prepped in advance! Glad you’ve found a way to enjoy your guests and your party! I know you only shop at Meijer but Aldi has MANY affordable gluten free crackers, pretzels, chips, etc that are yummy even for those of us that eat wheat. Keeping some in the house has helped me be able to serve those with sensitivities easier. If children are a big part of the group, even 100% fruit fruit gummies might be a treat!